As you can see its very tight at the top of my ratings and any of the 3 could win, looking at the trainer/jockey stats for Archimedes it doesn't look great, the trainer is 0-3 here and the jockey is 0-29 for the stable and its best time was recorded in 2017 and been nowhere near that level so far this year plus stall 10 is far from ideal, ASK THE GURU 15/2 is a possible front runner and could set the pace from stall 2 and could then be hard to catch but ESSAKA 5/1 ought to be staying on strongly at the finish, the trainer has an 18% win rate here and the jockey has a 21% win rate for this stable both pointers to the connections expecting a big run here but I will go with backing both selections to cover the angles. Encore D’or should be staying on strongly at the finish but maybe not quickly enough to win this race unless my top 2 falter, MIRZA 14/1 is the one I expect to set the pace here and could then be hard to catch but i have got GRACIOUS JOHN 15/2 rated higher but this ones best time was recorded at Haydock and that time is now looking a bit of a fluke time but I will go with backing the 2 selections to cover the angles. 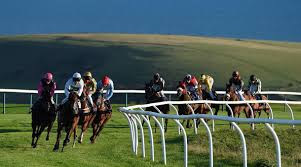 I've got Vallarta as my 3rd top rated but I have gone back to 2017 to find that rating, the 3-year-old PRESTBURY PARK 10/1 is a possible pacesetter and could be dangerous if getting to the front but I've got SPIRIT OF WEDZA 6/1 at the top on my figures and once again I will go with 2 selections to cover the angles. My 3 top rated are all possible pacesetters and that will make sure the early pace will be fast which will play into the hands of the strong finishing Pea Shooter if they go off too fast but both MANSHOOD 10/1 and BAHANGO 25/1 could win if they run to their best so again I will be backing the 2 selections each way at the prices available. In this division I've got Suwaan in 3rd spot and this one ought to be staying on at the finish, OUTRAGE 5/1 my 2nd top rated is a likely pacesetter in this race and if getting to the front could prove hard to catch but my top rated TYLERY WONDER 12/1 is a versatile type which includes being able to lead but would need to spring back to form so I will back both just in case my top rated isn't back to its best.